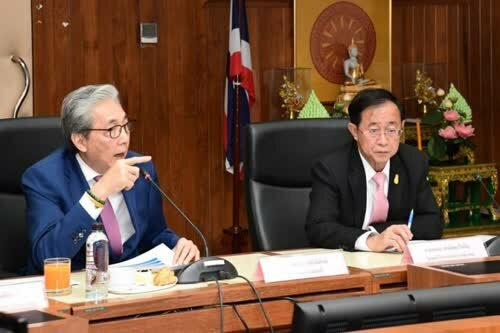 BANGKOK, 12th February 2019 (NNT) - Thailand’s Deputy Prime Minister Somkid Jatusripitak has called for the speedy distribution of the fiscal budget to ensure continued investments. Chairing a meeting at the Ministry of Transport, the deputy premier in charge of economic affairs asked ministry officials to make sure the allocation and distribution of funds for state-sponsored projects in the first two quarters of 2019 are carried out according to plan, so that the country’s economic growth is less reliant on exports which could potentially be impacted by global uncertainties such as the trade dispute between China and the US. Important projects lined up in the first half of 2019 include the procurement of 38 aircraft by Thai Airways, the details of which will be finalized before the end of February, the expansion of Suvarnabhumi International Airport, the high-speed rail project and the face lift of the Port of Bangkok or Klong Toey Port. In the meantime, Transport Minister Arkhom Termpittayapaisith said, between February and March, his ministry will seek Cabinet approval for several investment projects including 8 dual-rail projects, the construction of an aviation maintenance and repair center and electric rail projects.